Ethiopian Airlines, the largest airline in Africa, has unveiled its new $65 million hotel located adjacent to Bole International Airport of Addis Ababa. 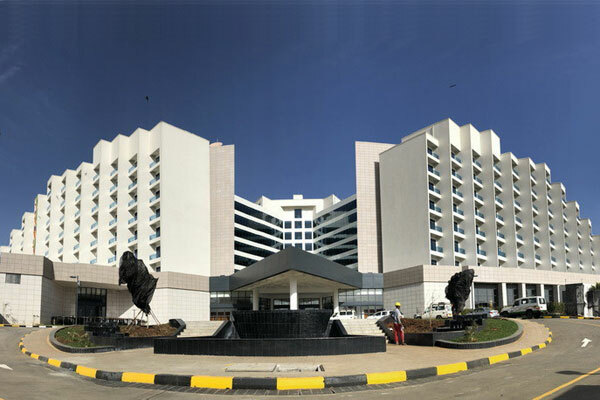 The Ethiopian Skylight Hotel, part of the Chinese hospitality brand Grand Skylight Hotel, features 373 guest rooms and spacious executive suites, the largest Chinese restaurant in Africa and a conference hall that can accommodate 2500 people. The Ethiopian prime minister Abiy Ahmed and Ethiopian Airlines CEO Tewolde Gebre Mariam presided over and spoke at the grand opening. Ethiopian senior government officials, diplomats, international luminaries and global media representatives were among the close to 3,000 guests. "The hotel's ambience is great. It's contemporary, bright, and very luxuriously spacious, befitting a veritable landmark project in continental Africa," Ahmed said.